This shot shows what may have been a sort of training session, with the mother observing as the little one is unable to even reach the window. The photographer seems to have been not that fearful, as he/she was a little over half a car-length from the action…perhaps unaware that about 48 people would be mauled that year. 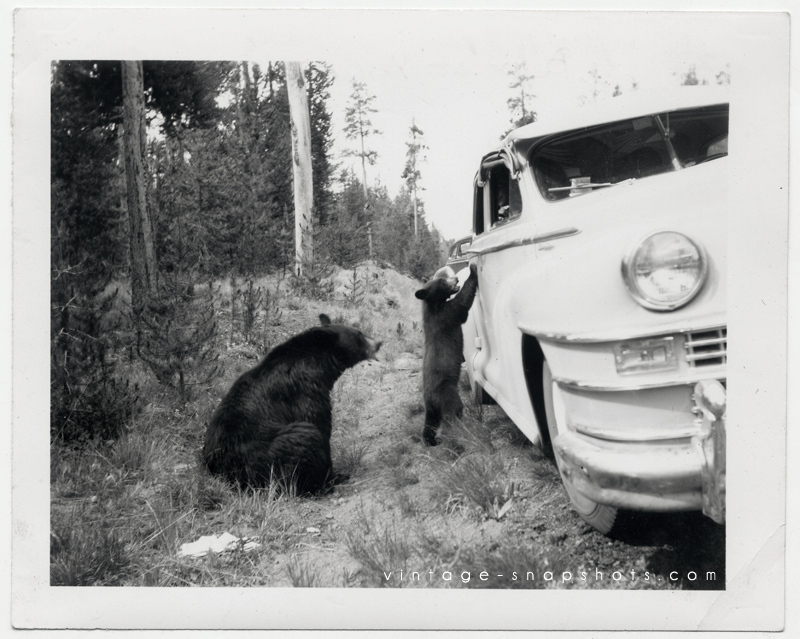 (Wildlife photographer Harry Morse, who visited Yellowstone during that era, remarks that “As a child I thought it was great that bears begged for food along the roads of Yellowstone. Park officials kept a lid on the annual number of people getting mauled and when it happened you didn’t hear about it.”) The practice is, of course, now banned – along with just about everything else in today’s world. Here is a nice color shot from National Geographic showing a couple of bears being photographed by onlookers.